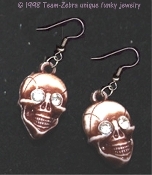 Realistic Mini Gothic SKULL EARRINGS - Rhinestone crystal CZ embellished miniature brown-enameled punk skulls charms - Detailed dimensional voodoo bony skeleton head, approx. 7/8-inch (2.19cm) tall x 5/8-inch (1.56cm) wide. Face on both sides.